There are many reasons for transferring Samsung files to external hard drive. For example, you need to make a backup of the contacts or photos so that you can no longer worry that you may lose the important data. Or the device operates more and more slowly and you want to transfer some videos or photos to an external hard drive to free the memory space. Anyway, no matter what situations you meet, you can get help from various tools. In this article, we could like to show you two ways to transfer files from Samsung to external hard drive. You can go through them and select one to reach your goal according to your own needs. How Do I Transfer Files to An External Hard Drive from Samsung by Using Samsung Kies? Due to the high risk of data losing on modern smart phones, Samsung have released their official backup & restore tool - Samsung Kies to all users. This tool can help users import/export, sync or backup/restore data between Samsung devices and desktop computer without hassle. It supports data like contacts, schedule, memo, photos, music, videos, etc. Thus, you can use Samsung Kies to export the files from your Samsung phone to computer and then move the exported data from computer to external hard drive. - Free and easy to use, requires no professional skills for both users. - Some file types are not supported, such as SMS, apps, and so on. - Transferring speed is slow and the program is easy to crash. Hence, for the users who want to transfer text messages, applications or other files that Samsung Kies does not support to PC or external hard drive, you need to find an alternative to Samsung Kies. The following is a professional Android data transfer software for your reference. How to Transfer Samsung Files to External Hard Drive with MobiKin Assistant? - Import files from PC to Android. - Uninstall or remove unwanted apps from Samsung devices. - Restore backups to Samsung devices without restrictions. 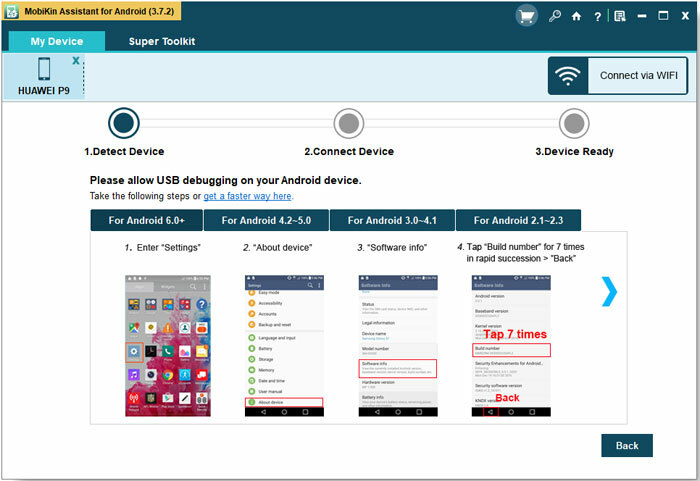 After the USB debugging, your Samsung will be detected by the software and all the files will be displayed on the left panel as different categories. You can click on the option according to the types of file you want to transfer and then preview the detailed items on the right panel. Mark the wanted files on the left panel and then hit the Export button on the top panel. Or directly use the "Backup & Restore" function by tapping on Super Toolkit > Backup > Choose the wanted files > Back Up. When the syncing process ends, your Samsung files will be saved on the computer. Then you can connect the external hard drive to the same computer and then copy and paste the desired data from computer to the device. Isn't it simple? Just download the free trial version of the Samsung Files Transfer tool to try it! How to Avoid the Risk of Data Loss on External Hard Drive? However, it doesn't mean that the data saved in external hard drive is 100% secure and you still have the risk of losing these files. Therefore, you'd better know the reasons that may cause the data loss on external hard drive and learn some skills to avoid the issue. This part will teach you some tips to avoid this situation. - The files are attacked by virus. - Always have a backup on your computer or cloud service. It is undisputed that transferring Samsung files to external hard drive is a good way to back up your phone data. 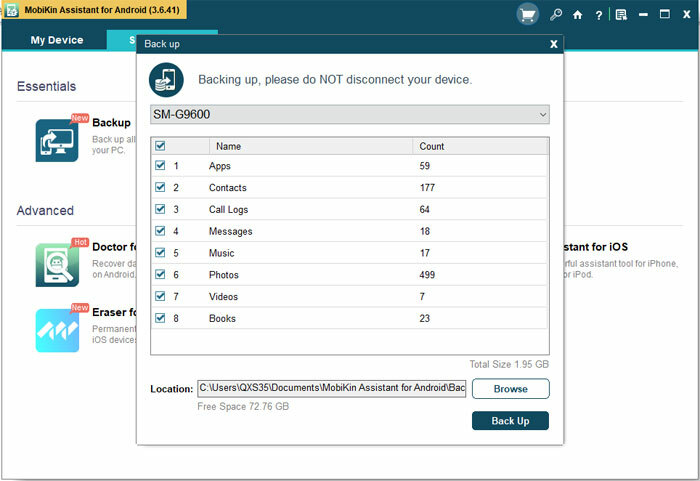 With the backup, you can manage your phone data more freely. But meanwhile, do not forget that the data on external hard drive need to be protected also. Only when you well protect both your mobile phone and external hard drive can you ensure the security of your files. How to Transfer Samsung Data Wirelessly? Android Backup: How to Back Up Android Photos to Cloud?